We’d love your help. Let us know what’s wrong with this preview of The Journal of Angela Ashby by Liana Gardner. To ask other readers questions about The Journal of Angela Ashby, please sign up. I'm 13 and this was a really good book!! The story was always painting a picture and movie in my mind. The explanation of the fortune teller's tent was probably my favorite part of the entire book. How the characters learned from their mistakes and made changes throughout the book made it very easy to relate to them. This book was an edge of your seat adventure! I definitely recommend this book to anyone and everyone! This was the first time reading a book from this author. It was different from books in this genre that I've read which became refreshing to me. If your looking for a great sink your teeth in book then this author provides it. Angela Ashby had been looking forward to attending the school carnival with her mother, but since the divorce she is working more, and Angela hardly gets to see her, or her father who left and married Holly the homewrecker. Luckily Angela has a close friend, Mallory. The two of them enjoyed the carnival together, savouring the moment until their wandering put them in front of a rather unusual tent, one belonging to a fortune teller. She gives each of the girls a reading and a gift, and Angela's Angela Ashby had been looking forward to attending the school carnival with her mother, but since the divorce she is working more, and Angela hardly gets to see her, or her father who left and married Holly the homewrecker. Luckily Angela has a close friend, Mallory. The two of them enjoyed the carnival together, savouring the moment until their wandering put them in front of a rather unusual tent, one belonging to a fortune teller. She gives each of the girls a reading and a gift, and Angela's gift has power beyond measure, anything she writes in it comes to pass. With a school struggling with a bulling problem, her parent's divorce, and so many changes she wants, Angela decides to use the journal. But actions have consequences, and even the most innocent thing can have profound effects. The Journal of Angela Ashby is set in the life of young middle schooler Angela Ashby and the reader follows her transition from a carefree child to one burdened with a journal that turns fantasy into reality. The character introduction lasts a fair number of chapters without feeling drawn out. The reader is introduced to Angela, her family, her closest friends, and enemies and then the story dives into the main subject of the plot, the powers of the journal. As a reader, we see Angela’s subtle transition on how she uses the journal. She struggles with her decisions and the story forces her to define her morality, her intentions, and their consequences. Angela is playful but mature for her age, and The Journal of Angela Ashby has a good moral standpoint on bullying and dealing with family issues, which makes me recommend this story for middle school and freshman in high school. Revenge and the transition of becoming a bully lingers in her thoughts. The author, Liana Gardner, spins a story young people going through coming of age struggles can relate to. But during the time I read this story, a concern of mine arose. I was told The Journal of Angela Ashby is “a middle-grade Death Note.” The largest mistake I can make is to hear other people’s interpretations in fear of letting the words of another take influence. In the back of my mind, I had to keep the comparisons at bay because the thought of killing another human being should be the farthest thing from a twelve-year-old girl’s mind who is also transitioning into adolescence and that she is not an eighteen-year-old genius with a silver tongue. Twelve Year Old Angela Ashby is dealing with a lot at the moment. Her parents are divorced and neither her mom or her dad seem to have time for her anymore. At school, there is a bully that loves to pick on Angela and her best friend, Mallory. Things begin to change, however when Angela and Mallory attend their school's carnival. A mysterious fortune teller gives each of the girls a gift, a necklace for Mallory and a journal for Angela. The journal comes with a warning though, "With great power Twelve Year Old Angela Ashby is dealing with a lot at the moment. Her parents are divorced and neither her mom or her dad seem to have time for her anymore. At school, there is a bully that loves to pick on Angela and her best friend, Mallory. Things begin to change, however when Angela and Mallory attend their school's carnival. A mysterious fortune teller gives each of the girls a gift, a necklace for Mallory and a journal for Angela. The journal comes with a warning though, "With great power comes great responsibility." It takes Angela a while to figure out what the warning means as the hopes and dreams that she writes down in her journal begin to come true in her life. 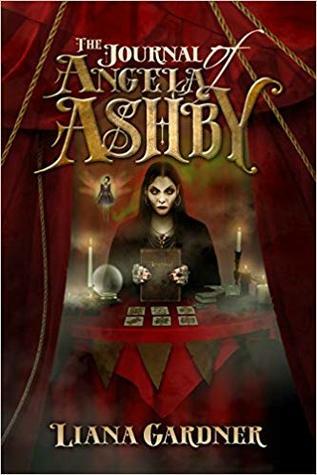 The Journal of Angela Ashby is an exciting and magical middle grade drama. Angela and Mallory were wonderful main characters and the inclusion of fairies, gnomes and unicorns helps to keep the book entertaining. The characters were realistic as pre-teens in their actions and motives. I enjoyed that the journal was not only a source of fun, but also responsibility that helped Angela to realize the impacts of her actions on those around her as well as help her grow into a caring person. There are also many good lessons on friendship, family and bullying. As an adult reader, the middle of the book got a little boring for me as Angela continued to test out journal entries to see what would happen, although this is also where many of the fun characters come in, so middle grade readers may be more entertained. Overall, an entertaining, supernatural adventure for middle grade readers. THE JOURNAL OF ANGELA ASHBY is a story about a journal that the heroine receives from a fortune teller that turns out to be magical. Readers will enjoy the element of magic and mystical creatures as well as getting to know Angela and her best friend, Mallory. An overall cute story. I thought the journal was the funnest part of this story. It added plenty of mystery and also created quite a bit of havoc. I also really liked Mallory. Angela has some growing to do. She didn't really think about any of the consequences of her choices, but she was a good friend to Mallory. The ending left thing resolved, but also open for a second book. I did have a few issues with the story. I didn't always feel the girls acted their age (I have a 12-year-old daughter, so it was pretty easy to compare). Sometimes Angela acted characteristically younger and sometimes older, so she didn't feel completely genuine. She also wasn't a character I loved. I also felt like the bullying was a bit unrealistic at school around teachers and other adults. In the end, was it what I wished for? An overall intriguing story that middle graders and tweens may enjoy. Content: Some bullying, name-calling, blunt/crude language. I received a copy of this book from the author via Jean Book Nerd for an honest review. There has been no compensation for this review. Only the pure enjoyment of a book in my hands and reading a story. The Journal of Angela Ashby by Liana Gardner is a middle grade fantasy about a girl learning she has great power, but with it, she has to be responsible. I really liked this book. It's adorable, has a good message, and I feel it would work for both boys and girls. I know I plan on giving it to my I received a copy of this book from the author via Jean Book Nerd for an honest review. There has been no compensation for this review. Only the pure enjoyment of a book in my hands and reading a story. The Journal of Angela Ashby by Liana Gardner is a middle grade fantasy about a girl learning she has great power, but with it, she has to be responsible. I really liked this book. It's adorable, has a good message, and I feel it would work for both boys and girls. I know I plan on giving it to my Bug when he's old enough to read it (he's six currently). Now, for the lit nerd in me, the book has great character development. It isn't just the main character who changes, but so do the minor characters. I do feel bit bad about the main antagonist, but I have a feeling there may be more about her in the future. This book is a quick read and well written. It is definitely a book for both adults and children. What an AMAZING middle grade read! I fell in love with the story of a magical Journal! It fits perfect with the age because what middle grade girl doesn't keep some sort of Diary? This story has more than magic. It deals with real life situations... Divorce... Bullying... Friendships...while teaching that your decisions causes a chain reaction, and how it can affect those around you without intending to. It also teaches you to learn from your mistakes. Fairies, Gnomes, and unicorns...oh I love the i What an AMAZING middle grade read! Fairies, Gnomes, and unicorns...oh I love the imagination! This is a cute YA story with a moral compass. Angela and her best friend Mallory are trying to navigate the intricacies of middle school when they someone end up in a fortune tellers' tent at the school fair. Both are given talismans to guide them. Angela's talisman comes in the form a journal that can affect real life and people. But we all know that "magic" comes with a cost and consequences. With Mallory and her new friends Angela learns to find her moral compass. This is a book for middle graders about a 12 year old named Angela Ashby. Angela and her best friend named Mallory. Angela and Mallory visit a school carnival and decide to get their fortunes read. The fortune teller gives Angela a journal to write her feelings in. This unleashes a chain of events with good and bad consequences. Another awesome middle grade adventure from a woman who really knows her audience. Liana is as comfortable with Harry Potter-esque fantasy as she is with Goonies-style action. Once again a story that would easily transfer to the screen. A cute story that tackles many important subjects. Responsibility, decisions, bullies, and the consequences of your actions. Loved it! A wonderful book for tweens to read. The author incorporates real life issues with a magical twist. My middle schooler started reading it and is enjoying it aswell. I'm working on writing my review now. It will be posted here after it goes live on my blog, that may take some time though because I am quite behind on review writing. Liana Gardner is the multi-award-winning author of 7th Grade Revolution , The Journal of Angela Ashby , and the Misfit McCabe series. The daughter of a rocket scientist and an artist, Liana combines the traits of both into a quirky yet pragmatic writer and in everything sees the story lurking beneath the surface. Engaged in a battle against leukemia and lymphoma, Liana spends much of her time at Liana Gardner is the multi-award-winning author of 7th Grade Revolution , The Journal of Angela Ashby , and the Misfit McCabe series. The daughter of a rocket scientist and an artist, Liana combines the traits of both into a quirky yet pragmatic writer and in everything sees the story lurking beneath the surface. Engaged in a battle against leukemia and lymphoma, Liana spends much of her time at home, but allows her imagination to take her wherever she wants to go.